Subject: Why Are Oil Prices Dropping Today? 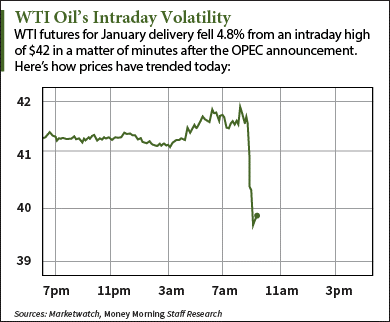 Energy investors are asking, "Why are oil prices dropping today?" After all, WTI crude oil prices rallied 2.9% yesterday (Thursday) to settle just above $41 a barrel. But the U.S. benchmark abruptly dropped 2.7% today (Friday) after the Organization of the Petroleum Exporting Countries (OPEC) made a big announcement at its semi-annual summit. At 9:15 a.m., WTI crude oil prices were trading at $39.98. The U.S. benchmark has had an exceptionally volatile week and already fell under the $40 mark on Wednesday. Futures have declined an average of 1% every day so far this month. Brent crude oil prices were also down this morning. The global benchmark fell 2.2% to $43.47 a barrel. Prices are down 3.9% in December so far. Oil prices began their mid-morning decline after OPEC said it would raise its production ceiling to 31.5 million barrels a day. Analysts had expected the cartel to keep it at its already high level of 30 million barrels. Raising production was not on many analysts' radars. The announcement comes out of Vienna, where all 12 cartel members are meeting to discuss the state of the oil market ahead of 2016. This year, OPEC's strategy has been to churn out as much oil as possible to protect market share and harm competitors. While the cartel decided to maintain its strategy at the last meeting, its announcement today marks an aggressive step to send prices lower to edge out U.S. and Russian producers. However, the new ceiling is viewed as largely symbolic. That's because OPEC's "established" output quota has been a lie throughout the entire year.